The streets may not be ready for Shokotan's "cicada shell" look, but that doesn't stop the multi-talented entertainer from decking herself out on occasion. 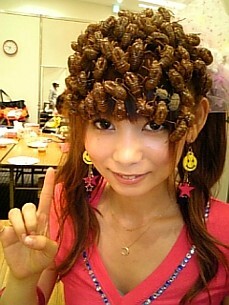 Shokotan, who talked about her fascination with cicada molts and showed off part of her collection in a television appearance last year, showed up at a recent concert wearing the insect shells on her head. According to this article on Excite News, the crowd went wild at the end of her performance when she tossed the crispy shells into the front row. oh hell no! those things freak me out! Well stezton who cares if they freak the freak out of you because guess what they wanted to post it on the internet . In who's face , in your face . SHABOOYA !!!!!!!! She is the cutest, dumbest j-girl I've ever seen. There is a fine line between "art" and "stupidity." Yotsuba could easily catch her. 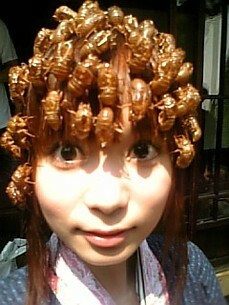 Cicadas come every year. Although they take 13 years to mature, there are new crops every year so they hatch every year. Its one specific breed that comes every thirteen years. Others hatch every year. I love it! Creative and fun! Much better than the last blog I read on this subject! In the southern United States, we pay good money to get get rid of creepy crawlies. I can recommend a good exterminator or a good psychiatrist, both of which seem appropriate. There is clearly some confusion about what a molt is here. People are reacting like she has either live bugs or dead bugs on her person. These are just hollow shells. The bug outgrows it and buggers off. That is why there is a split in the back. This is no more unsanitary than putting tree bark on yourself. Having grown up in a area that was populated with cicada shells seasonally, as a kid I always found them to be very cool. As a kid, and still, I was/am not into bugs in general, but the husks they leave behind are like little perfect bug models. I would probably have one on my desk or hanging from my monitor if I still lived in an area with them. 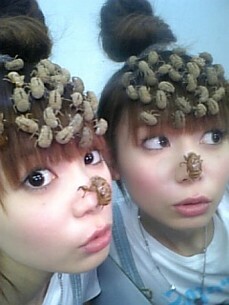 @Reason idc if they are just shells it's still creepy/nasty or whatever you want to call it and I wouldn't suggest anybody in thier right mind to do this they belong on trees or whatever NOT in a girl/womens hair i don't know what she was thinking but i don't think this will be a new trend anytime soon !